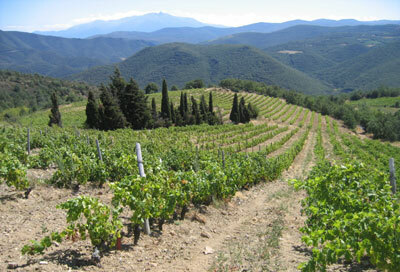 Gérard Gauby was a pioneer of modern winemaking in the Fenouillèdes region when he discovered a long-abandoned vineyard high in the hills of Roussillon in 2001. When he told his UK importers, Roy Richards and Mark Walford, of this discovery, a joint venture was born which they named ‘Le Soula’. From their first vintage it was clear this project was capable of producing quite profound wines from native grapes including Macabeu, Grenache Blanc, Grenache Gris and Malvoisie du Roussillon for white wines and Carignan, Grenache and Syrah for red wines. There is also less traditional Sauvignon Blanc, Marsanne, Roussanne and Vermentino in the white grape portfolio. The oldest vineyards are truly ancient, dating from 1919, though the majority were planted in the 70s. Though not certified organic or biodynamic, no synthetic chemicals are used in Le Soula’s vineyards and the estate follows biodynamic principles, including respect for the lunar cycle. The estate produces only four wines: Le Soula Blanc and Rouge, and second label (not tasted here) called Trigone, again a Blanc and a Rouge. 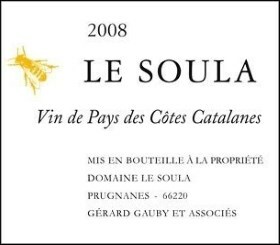 By 2008 Le Soula had outgrown its original home in the village of Saint Martin de Fenouillet and relocated to the renovated cellars of the ex-cooperative at Prugnanes. Winemaker Gérald Standley joined the team, working alongside Gauby as day-to-day manager of the domaine. I have tasted these wines regularly since that first 2001 vintage, and they are remarkably fine, intriguingly powerful and yet subtle wines that age quite beautifully. By coincidence, the 2003 red was on the list of The Square restaurant where I ate a couple of evenings before publishing this review, and it was such a fine gastronomic wine, not showing the heat of 2003 in particular, its berry and lightly gamy qualities matching beautiful with a wild mushroom and roast partridge risotto. These are indeed great food wines, but more than that, with their herb and subtle garrigue influences and their old vine, high altitude and mineral concentration they are indeed ‘terroir wines’ that say something not only about the grapes they are made from and the hand of the men behind them, but about the place they come from. The wines are imported into the UK by Richards Walford, and have fairly good distribution through independent wine merchants and restaurants. They are priced around £20 per bottle. See all stockists on wine-searcher.com. A blend of many grapes, but principally Sauvignon Blanc (38%), Macabeu (35%) and Vermentino (19%). The 14% alcohol in this wine is a typical and unavoidable by-product of fully ripening grapes in the hot, dry Roussillon. Ageing in large oak barrels, the majority of older oak, has added a crushed oatmeal and gently honeyed toast to white flower and firm apple and mineral notes. On the palate the oak adds just a supporting breadth and very discreet toast, the substance of this wine being the pure old-vine concentration of its fruit and the searing core of mineral acidity that runs through it. Yes, there is a trace of alcohol heat in the finish, but it is the clarity and purpose of the finish that drives this. 91/100. £21.95, Berry Bros & Rudd. The composition here is quite different, still led by Sauvignon Blanc (30%), but with 25% Grenache Blanc, 25% Marsanne and Roussanne and 10% each of Macabeu and Malvoisie. Ageing in 500-litre demi-muids, only 30% of which were new. It is immediately mellower and more integrated on the nose, with a fine, vegetal and gravel edge of minerality, but a warmth and peachiness to the fruit. On the palate this has that tremendous precision again, but it has a slightly more exotic tone to the fruit and slightly more sweet-edged attack that is delightful. The creamy and lightly spicy oak is there in the finish, but so too is that powerhouse of concentration and lemon and mineral acidity. Long too. 93/100. The red blend for 2008 is 55% Carignan, 35% Syrah and 10% Grenache Noir and the wine is aged for 18 months in demi-muids – large, 600-litre barrels. It has a very fresh, crimson colour and a delightful nose, the ripe summer berry fruit aromas melding with touches of smokiness and tobacco, and an almost imperceptible gamey nuance. On the palate it is quite a substantial wine. Medium- to full-bodied and with a creamy texture, 14% alcohol perhaps adds to the slippery texture, and there’s a taut spine of tannin and acidity at the core. But the fruit – sweet, but tight and a little lighter than the 2008 – is sharp and focused into the long, lightly-spiced finish. 93/100. £21.95, Berry Bros & Rudd. The 2006 rouge is composed of 45% Carignan, 20% Grenache, 20% Cabernet Sauvignon and 15% Syrah, and 12,000 bottles were produced. The alcohol is a modest 13%, and that brings a certain cool fine’s to the wine. The nose is delightful, almost Burgundian with truffle and a hint of forest floor, and a back-up of spicy, fudge-like berry fruit depth. On the palate this strikes with quiet authority, its wonderful core of tight, creamy tannin and acidity giving those gamy and truffle-sweet tones and the more rounded, sensual black fruit beneath fine support. This has flesh and mouth-filling sweetness of fruit, yet it has great precision and backbone too. A truly terrific wine. 95/100. See all stockists on wine-searcher.com.